"Charge transfer" (CT) component, considered to represent resonance-type "delocalization" interactions between filled orbitals of one subunit and unfilled orbitals of the other. Although there is widespread agreement on the general form of Eq. (1) and the quantum mechanical integrals contributing to overall ΔE, sharp disagreements persist on how individual integrals should be regrouped for labelling as "EL", "EX", "CT" contributions. independent of how EL(MEDA) is evaluated. The integral <ψA|H|ψB>eq superficially resembles the perturbative interaction integral between unperturbed ψA, ψB wavefunctions of the non-interacting long-range limit. Indeed, as RAB → ∞, this interpretation is valid and Eqs. (2)-(3) become exact. In the same limit, ψA, ψB are mutually orthogonal and CT(MEDA) vanishes, in accordance with London's long-range perturbation theory . and no possible physical (Hermitian) "unperturbed Hamiltonian" could underlie such interpretation (because non-degenerate solutions of Hermitian eigenvalue problems are necessarily orthogonal). For H-bonded complexes, equilibrium RAB separations are commonly found to be 0.5-1.0 Ångstrom inside the formal van der Waals contact distance at which exchange-type overlap is expected to increase exponentially, and for torsional interactions the overlap issues are still more severe. MEDA-style components are therefore seen to be inherently dependent on AO overlap (required, e.g., for any non-zero evaluation of CT(MEDA)), exemplifying "overlap-dependent" interpretation (and labeling) of CT.
Why is AO overlap a critical issue for evaluation of CT? As shown in Eq. (4), MEDA evaluation of CT originates not in physical identification of donor-acceptor (filled-unfilled) orbital interactions, but in the overlap-dependent "remainder" of a long-range identity that is applied improperly in the region of significant exchange-type interactions. This contrasts sharply with NBO-based EDA techniques, which are always formulated in the overlap-free domain of NAOs, assuring strict probability conservation and consistent natural charge assignments throughout subsequent hybridization, covalent bond formation, and supramolecular complex formation. Disagreements between MEDA and NBO-based EDA assignments of CT can therefore be traced squarely to disparate handling of AO overlap . The intrinsic ambiguities of overlap-dependent charge assignments strongly affect how electrons are perceived to be distributed between one atomic center or another (as well known, e.g., in the pathologies of Mulliken population analysis). Morokuma-type evaluation of CT is intrinsically tied to ambiguous AO overlap terms that confuse assignments of atomic charge, resulting in profound disagreements over "transfer" between one monomer or the other. Related Ziegler-Rauk, Bickelhaupt-Baerends, BLW, and ALMO-EDA methods  handle overlap-density terms in slightly different ways, but all differ sharply from overlap-free NBO methods in this respect. R-dependent basis set superposition (BSSE) artifacts (often significant in non-augmented AO basis sets). To incorporate such higher-order effects consistently in traditional EDA-style additive components, Glendening and coworkers  developed the "Natural Energy Decomposition Analysis" (NEDA) method. The NEDA keyword requires an intricate sequence of interactive calculations between NBO6 and host ESS, and is currently implemented only in GAMESS, FIREFLY (PC-GAMESS), and NWCHEM host systems. All NEDA energy evaluations in Eq. (6) employ the full basis set of the complex, so that ΔE automatically incorporates the full Boys-Bernardi "counterpoise correction"  for BSSE. then defines the starting "localized" (ψ(loc)) wavefunction that underlies evaluation of each NEDA component. corresponding to combined electric field and quantum mechanical effects experienced by each fragment within the complex. By combining the definitions for EL [Eq. (12)], CORE [Eq. (13)], and CT [Eq. (9)], one readily verifies that these components satisfy the basic NEDA ansatz, Eq. (7). In addition to the energies E(ψA), E(ψA(def)), NEDA also calculates the dipole moments (μA, μA(def)) for the wavefunctions ψA, ψA(def) of each fragment. The difference between these two vector quantities is a measure of the induced dipole due to complex formation, which asymptotically reduces to the corresponding classical expression in the long-range limit. NEDA differs significantly from other NBO keyword options. The "NEDA" keyword is only allowed within a $DEL keylist (not in the usual $NBO keylist) and must always appear with accompanying "END" in keylist-like "NEDA [fragment units] END" form. For the sake of specificity in the tutorial instructions below, we assume that GAMESS is the host ESS program and that the user has some general familiarity with GAMESS keyword groups and syntax. again implying that the desired fragments A, B,... are those of default NBO search. (Note however that the program will halt if the molecular units of the alpha spin set are different from those of the beta spin set, so more detailed specification of NEDA fragment units is necessary in this case.) One can also choose to perform NEDA with alternative NAO rather than default NBO basis set, in which case the default "units" are individual atoms rather than bonded molecular units of the NBO search (see below). NEDA fragment wavefunctions can be evaluated by any $SCF group options available in GAMESS input, including SOSCF, DIIS, damping, and direct energy minimization (DEM) methods to control convergence. As in other $DEL applications, use of symmetry should generally be disabled by setting NOSYM=1 in the GAMESS $CONTRL group and NOPK=1 in the $INTGRL group. that specify atoms (B1,H3,H4,H5) as one fragment and (N2,H6,H7,H8) as the other. Other $DEL command keywords can be included as usual in the keylist, including alternative NEDA fragment analyses. Each such NEDA or non-NEDA command will be processed in turn for output display. See Sec. B.5 of the NBO Manual for further information on $DEL keylist syntax. As shown in the $DEL keylist, NEDA will perform default analysis using the two molecular units (water monomers) of the NBO search. Fock matrix by doing one SCF cycle. This $DEL estimate of CT is in sensible qualitative agreement with the corresponding perturbative estimate (ΔE(2) = -15.21 kcal/mol) for the dominant nO(1) → σ*O(4)-H(6) interaction (as usual, ΔE(2) somewhat overestimates the variational $DEL energy change, due to neglect of higher-order coupling terms). From the $DEL occupancy changes, one can also see that localizing the wavefunction back-transfers about 0.018 electrons from NBO 14 (the σ*O(4)-H(6) antibond acceptor) to NBO 8 (the nO(2) lone pair donor), effectively suppressing the leading CT interaction of the dimer. The calculated expectation energy of localized ψA(def) (-75.88200 a.u.) is obtained by single-pass SCF evaluation with the localized monomer MOs of the previous step, whereas that of optimized ψA (-75.90941 a.u.) is obtained after complete SCF convergence. Both wavefunctions are calculated in the full dimer basis at the fixed monomer geometry in the complex, thereby incorporating the complete counterpoise (cp) correction for this rather small basis. The final lines of this segment display the calculated dipole moment for the perturbed (def) and optimized (cp) wavefunctions, showing the relatively small shift (induced "ind" dipole = 0.1747 Debye) from 2.6406 in the isolated monomer to 2.6557 Debye in the presence of the other monomer. In effect, the strict orthogonality required of the two monomer wavefunctions prevents the electron distribution of the donor from significantly penetrating the acceptor. 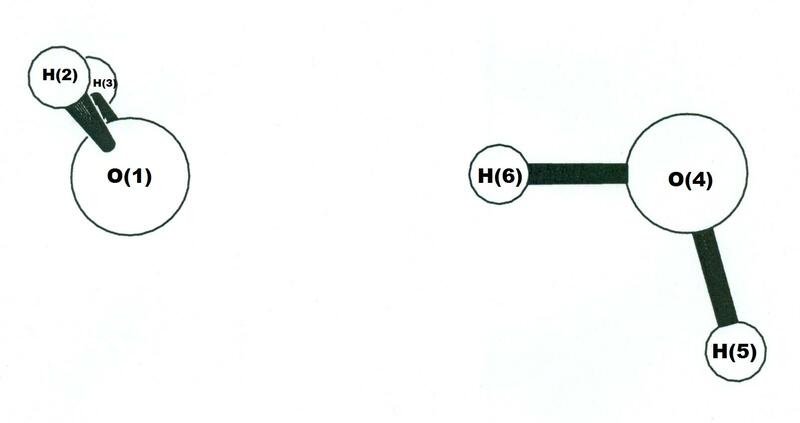 In this case, the induced dipole for the acceptor is seen to be rather sizable (0.3234 Debye), reflecting the significant polarization of σO(4)H(6) away from the donor (thereby better exposing σ*O(4)H(6) to nucleophilic attack), as seen in the NBO polarization coefficients. Nevertheless, as will be seen in the energy summary below, such polarization (induction) changes make only secondary contributions to H-bond energy. As shown in the final lines, the combined electrical (EL: -14.25 kcal/mol), charge transfer (CT: -13.25 kcal/mol), and core (CORE: +21.29 kcal/mol) contributions add up to the calculated total interaction energy, -6.22 kcal/mol. In this case, CT (-13.25 kcal/mol) and ES (-12.24 kcal/mol) are the largest individual contributors to binding, with POL (-3.89 kcal/mol) playing an important secondary role. These strong attractions are necessary to overcome the strong CORE repulsions (+21.29 kcal/mol) at the equilibrium geometry of H-bonding (far inside van der Waals contact), resulting in the final net H-bond energy of -6.22 kcal/mol. How Do NEDA Results Compare With Other Energy Decomposition Methods? From the introductory discussion, we should generally expect strong differences between NEDA (overlap-free) and MEDA-type (overlap-dependent) decompositions, and the water dimer proves to be no exception. Through the hidden AO overlap terms  that enter the <ψA|H|ψB> integral of Eq. (2), the critical nO(1) → σ*O(4)H(6) CT interaction is largely absorbed into "EL + EX" terms in MEDA-type partitioning. CT(MEDA) is then obtained [Eq. (4)] as a feeble "remainder" term, evaluated by Umeyama and Morokuma  as CT(MEDA) = -2.1 kcal/mol for RHF/4-31G water dimer (in slightly different geometry). The near order of magnitude disagreement between what NEDA vs. MEDA partisans consider to be the accurately evaluated "CT" naturally inspires impassioned debate! (The "CT vs. electrostatics" debate in the H-bond case is mirrored by corresponding "CT vs. sterics" debate in the rotation barrier case.) Still greater disagreements separate both methods from the "Intermolecular Perturbation Theory" of Stone and coworkers . According to the latter, CT is not merely of secondary importance, but "ill-defined" and "part of the induction (polarization)" component that "vanishes in the limit of a complete basis" . Despite such points of disagreement with older methods, one can see that NEDA clearly recognizes the importance of EL interactions. Indeed, from NEDA results presented above, one might conclude superficially that the largest contributions to H-bonding (ES + POL + SE: -14.25 kcal/mol) are "electrical" in nature, consistent with the presumption expressed in many textbooks. However, from NCE analysis or similar considerations, one can judge that much of the quasi-classical EL interaction is CT-induced, amplified by the deep inter-penetration of van der Waals radii that only resonance-type CT interactions could enable. How Else Can We Confirm the Unique Importance of CT for H-Bonding? The "transferred" charge in nO(1) → σ*O(4)H(6) delocalization (0.018e, ~0.1% of the total electron density distribution) may seem too miniscule to have any appreciable effect on the geometry or energetics of the H-bonded complex. However, we can test this assumption by deleting intermolecular CT interactions (with $DEL-based techniques) and re-optimizing the geometry of the dimer complex in the absence of CT. Because CT-deletion leaves >99.9% of the electron density distribution unaltered, it preserves practically all important electrostatic (dipole, quadrupole,...) and steric features of the monomers. Thus, such a $DEL-type reoptimization allows us to see the consequences of "purely electrostatic" (no-CT) (H2O)2 interactions in a rather direct manner. Geometry optimization with deletions can be performed more straightforwardly with Gaussian than with GAMESS. [Such optimizations are possible with GAMESS (see the deletions tutorial for sample input) but require the use of RUNTYP=TRUDGE and Hildebrandt-style coordinate input.] Below is a sample Gaussian input file for performing $DEL-type optimization of the water dimer, using constrained monomer geometries. NEDA is not implemented in Gaussian, so the calculation instead "zeroes delocalizations" between the two monomers in the $DEL keylist. The zeroing of delocalizations between monomers is effectively equivalent to the CT localization of NEDA. The results are shown below in graphical comparisons of the Umeyama-Morokuma H-bonded complex (upper) with the no-CT counterpart (lower). From visual comparison, one can see that the no-CT complex differs strongly in both radial and angular characteristics from the actual H-bonded dimer. The no-CT structure reverts to the C2v-symmetric structure expected for a classical "dipole-dipole complex", with no tendency toward linear or near-linear O···H-O alignment. One can also see that H2O···H2O separation increases by more than 0.3 Å to approximate van der Waals contact distance. Consistent with RO···O elongation, the net binding energy of the no-CT complex weakens by about 3.4 kcal/mol, to less than half the value of realistic H-bonding. Qualitatively similar differences between the geometry and energetics of full vs. no-CT complexes persist at all higher levels of theory. At the (unphysical) no-CT geometry, the neglected CT interaction energy (ca. 0.001% of Etotal) is virtually negligible, and only the EL + CORE components remain to exert significant forces on molecular geometry. Although EL attraction appeared only slightly less important than CT in realistic H-bond geometry, the $DEL calculations show clearly that electrostatic forces alone are unable to bring the monomers to the characteristic short distances, near-linear O···H-O alignments, and robust binding energies of authentic H-bond complexes. The resonance-type CT interaction is thereby identified as the unique "smoking gun" necessary to transform feeble dipole-dipole complexes to recognizable H-bonded species. Similar results are obtained  across the entire gamut of H-bond energies and types. K. Kitaura and K. Morokuma, Int. J. Quantum Chem. 10, 325 (1976); H. Umeyama and K. Morokuma, J. Am. Chem. Soc. 99, 1316 (1977); K. Morokuma, Acc. Chem. Res. 10, 294 (1977); K. Morokuma and K. Kitaura, in H. Ratajczak, W. J. Orville-Thomas (eds. ), Molecular Interactions (John Wiley, New York, 1980), Vol. 1, pp. 21-66. K. Morokuma and H. Umeyama, Chem. Phys. Lett. 49, 333 (1977); F. M. Bickelhaupt and E. J. Baerends, Angew. Chem. Int. Ed. 42, 4183 (2003). F. London, Z. Physik. Chem. B11, 222 (1930); R. Eisenschitz and F. London, Z. Phys. 60, 491 (1930); F. London, Trans. Faraday Soc. 33, 8 (1937); cf. F. Weinhold and C. R. Landis, Valency and Bonding (Cambridge U. Press, New York, 2005), p. 585ff. It may be questioned how ψA, ψB can be nonorthogonal when they are expanded in AOs on completely disjoint sets of atoms. The answer is that basis AOs on one atom commonly have overlap with AOs on all other atoms at finite separation, so electron density associated with AO-overlap regions cannot be uniquely assigned as being either "on A" or "on B". For further details on the relationship of nonorthogonal AOs to orthonormal NAOs, see the "NAOs in the AO basis" sample output from the MATRIX keyword. C. T. Corcoran and F. Weinhold, J. Chem. Phys. 72, 2866 (1980); A. E. Reed, L. A. Curtiss, and F. Weinhold, Chem. Rev. 88, 899 (1988); F. Weinhold and J. E. Carpenter, J. Mol. Struct. (Theochem) 165, 189 (1988); F. Weinhold, Angew. Chem. Int. Ed. 42, 4188 (2003). ALMO-EDA: R. Z. Khaliullin, R. Lochan, E. Cobar, A. T. Bell, and M. Head-Gordon, J. Phys. Chem. A 111, 8753 (2007); R. Z. Khaliullin, A. T. Bell, and M.Head-Gordon, Chem. Eur. J. 15, 851 (2008). E. D. Glendening and A. Streitwieser Jr., J. Chem. Phys. 100, 2900 (1994); G. K. Schenter and E. D. Glendening, J. Phys. Chem. 100, 17152 (1996); E. D. Glendening, J. Am. Chem.Soc. 118, 2473 (1996). S. F. Boys and F. Bernardi, Mol. Phys. 19, 553 (1970). I. C. Hayes and A. J. Stone, Mol. Phys. 53, 69 (1984); A. D. Buckingham, P. W. Fowler, and A. J. Stone, Int. Rev. Phys. Chem. 5, 107 (1986), and refs. therein. A. J. Stone, Chem. Phys. Lett. 211, 101 (1993). A. E. Reed, F. Weinhold, L. A. Curtiss, and D. J. Pochatko, J. Chem. Phys. 84, 5687 (1985); F. Weinhold and C. R. Landis, Valency and Bonding (Cambridge U. Press, New York, 2005), Sec. 5.2.